Mick Tait and Andy Saville push for a Pools equaliser in the last 20 minutes of the match. So near yet so far. That was Pools as they bowed out of the FA Cup after yet another heroic 1993 performance. We all know about the famous 1-0 win at home to Crystal Palace, but what about the game in the next round? John MacPhail who was magnificent in the Pools defence. It was away to Sheffield United and more than 4,000 Pools fans made the trip to Bramall Lane. Pools were not overawed by their Premier League rivals and held their own against a strong attacking force in the first half. They went into the half-time break holding United to a 0-0 draw and with Pools proving resolute in defence, especially with former Sheffield United star John MacPhail shining for the visitors. But after the interval, Dave Bassett’s side took the lead in the 47th minute. The move began with Kevin Gage who had been the starting point of most of the Blades’ best moves. We played very well in the second half and we feel we deserved something out of the game. The fans that came down were superb. 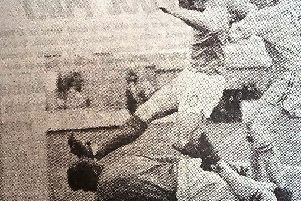 He played the ball wide to Franz Carr who whipped a cross in for Alan Cork to get on the end of. In a Pools team showing four changes from the third round Palace tie, Gallagher and Mick Tait looked impressive. The home team again went close when Jones made a point blank save as Cork threatened to double his tally. But it was Pools who came on strong towards the end. Andy Saville fired a shot just wide and substitute Nicky Peverell went close as well. Sadly, it was not enough to force a replay, but the Hartlepool Mail reporter at the time said: “Hartlepool United’s trip to Bramall Lane could easily have been the thing that fairytales are made of. After the match, Pools boss Alan Murray said: “We played very well in the second half and we feel we deserved something out of the game. Were you there for Pools’ FA Cup away-day in Sheffield, and what do you remember of the occasion?